I attended a number of car shows this year. 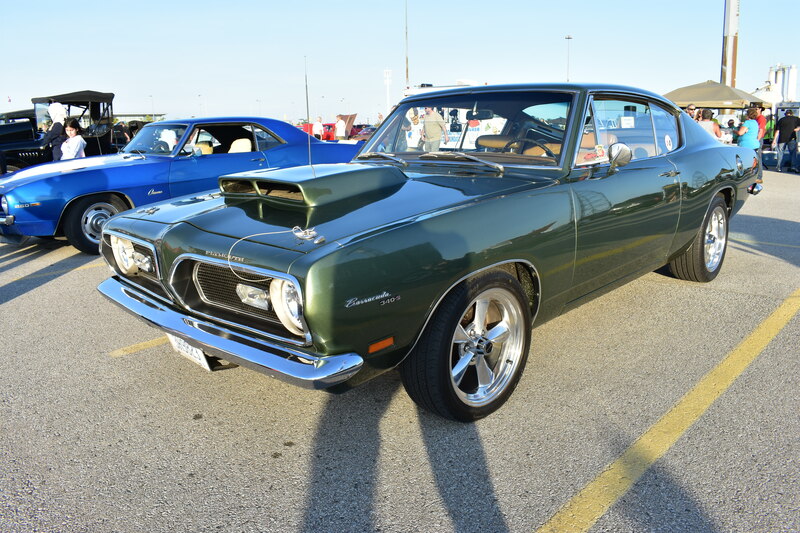 Perhaps six or seven, including some large ones like Moparfest (1400 cars) held near Kitchener, and some smaller ones like this one, held weekly during the summers. By way of explanation, the “GO Train” is a local commuter train serving southern Ontario, centered in Toronto. When first introduced, it was common knowledge that “GO” stood for the Government of Ontario, who had set up this service. With recent expansion of the service, and political wrangling over who owns what, I am not certain if this train service is still owned by the provincial government or who. No matter, the cars are what matter here. At this show, there were perhaps 50-60 cars this time. I’d like to take you for a walk around the lot to show you some of the more interesting cars (to me at least) on display. This pretty Ford Thunderbird is a 1966. I liked the design of the T-bird in that year much more than the preceding configuration. The pointy snout and the round taillights of the early 60s models were not as appealing to me, but this ’66 was a beauty. I believe Ford ‘got it right’ with this design. 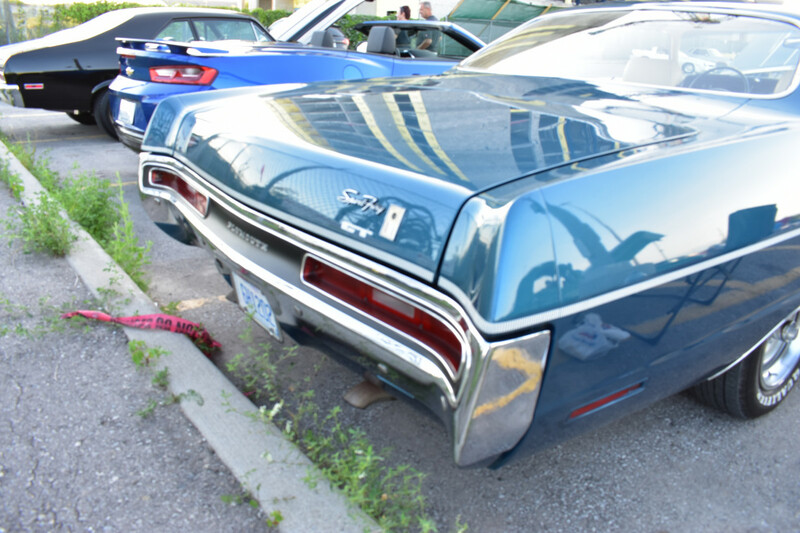 The taillights are gorgeous, and they were one of the first cars I had ever seen to feature sequential turn signals. The forward slanting grille is a work of beauty. I built an AMT model of one of these. Building a model of a car either increased my appreciation of the car, or created total disdain. Once when building an AMT 1965 Mercury Park Lane, nothing would fit together right. The more I got into it the less things fit, and much teeth gnashing took place. I never forgave that car, although I’m pretty certain that FoMoCo had nothing to do with the plastic fitting or not on AMT’s rendition. When building the car model, I had never seen a car with such an involved centre console, and such a tall dash. 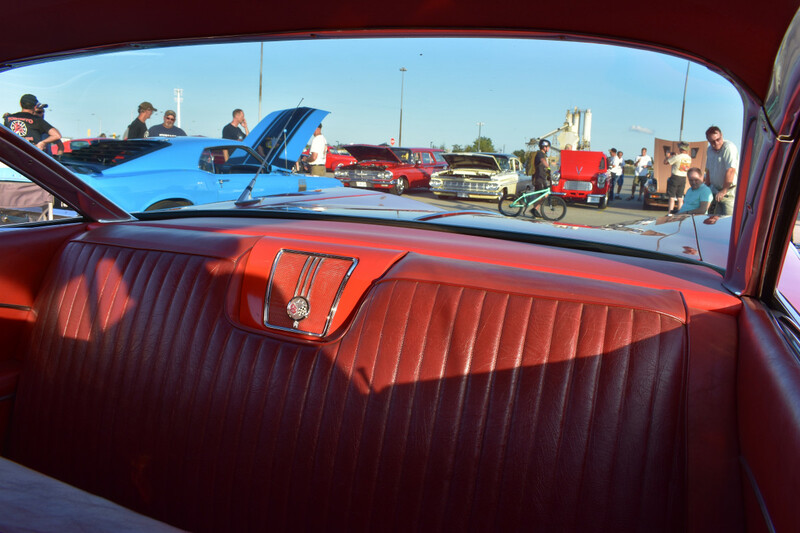 One observation on this car, if you look through a full version of the driver’s corner of the interior shot of the T-bird towards the 1955 Chevy, you can see a bit of windshield distortion. I remember that being a subject of some discussion in regards to safety back in the ’60s. Ralph Nader advocated for better windshield designs in his writings. 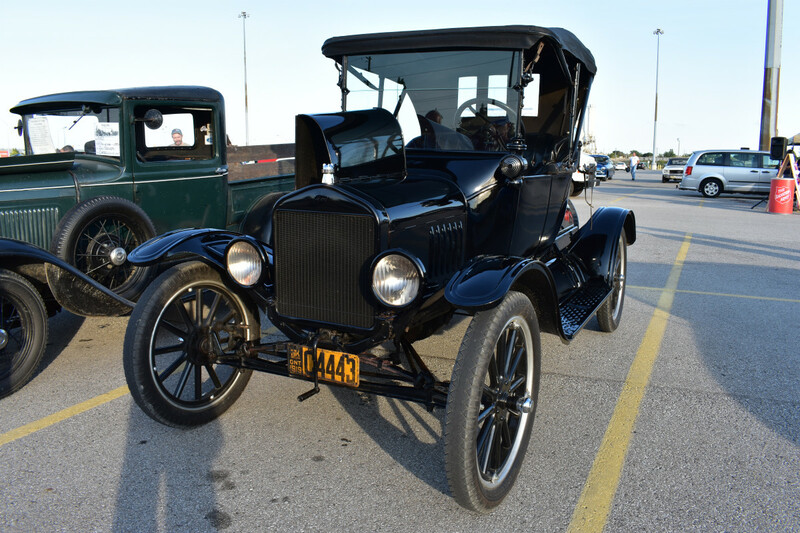 Outside of a 1917 Ford Model T I saw earlier this year at a wedding venue, this 1919 Ford Model T wins the award for the oldest car I saw at a show this year. This one has obviously been repainted and restored, and they shoes look like they have some wear on them as well. 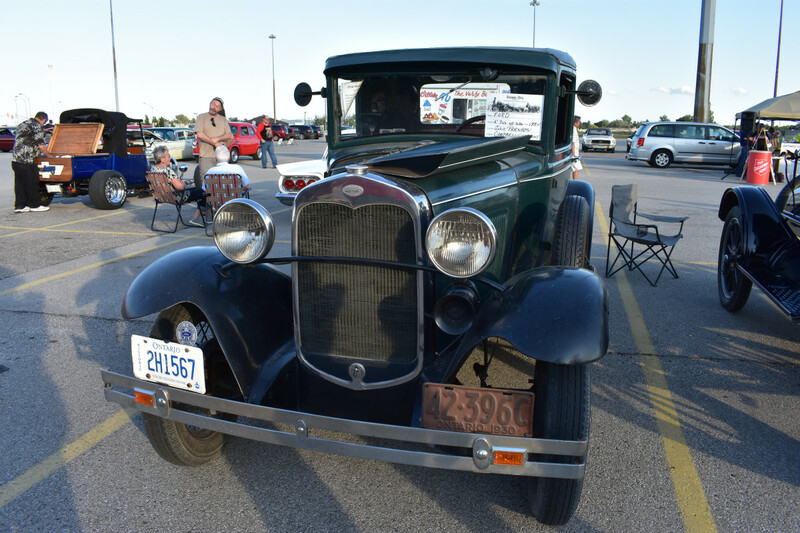 You don’t frequently see a car of this vintage at a weekly show ‘n shine. Sitting right next to it was a 1930 Model ‘A’. 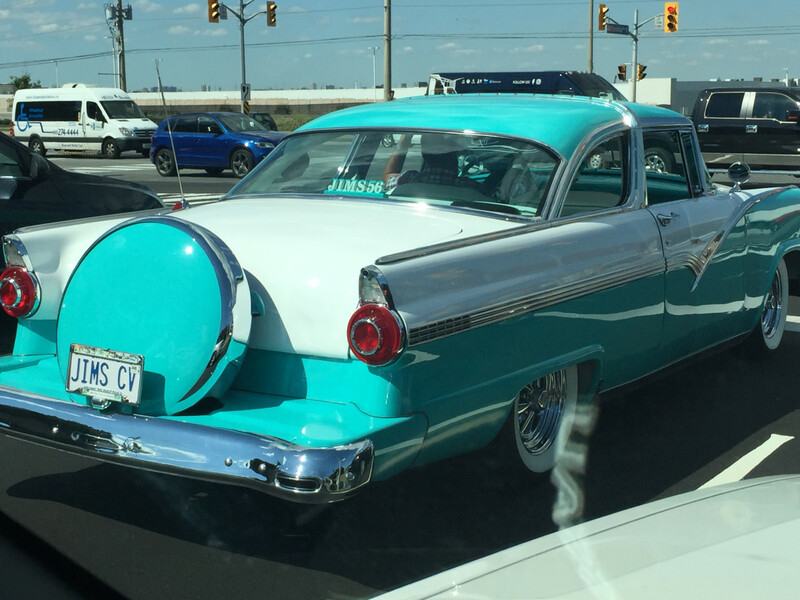 There must be some kind of 1956 Ford club in my area. Earlier this summer I saw another example with the same kind of signage in the back window. I never got a look at the front of the one I found at the intersection (Jim’s), but the continental kit sure was an eyeful. I would hazard a guess that the kit was added as part of a restoration. 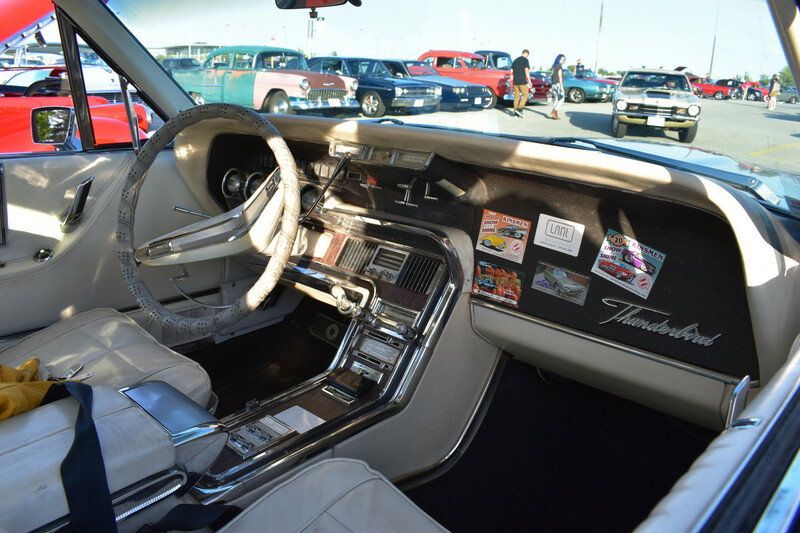 Fairlane original prices were $2046 to $2337, depending on whether you got a Crown Victoria Coupe (like Jim’s), a Victoria Coupe, or a Club Sedan. The price spread represents a difference from $18,447 to $21,060 in today’s currency (USF I believe), so these were mostly moderately priced cars aimed at mainstream customers. Looks like Merv added some non stock accessories to the interior of his Ford, including a custom gauge cluster. Obviously he wanted to enjoy some modern controls and comforts with his car. A concours judge might not agree, but who am I to disagree? The wire wheels don’t do anything for me however. Find me some nice chrome hubcaps, shine them up and the car would look much better and correct to my eye. 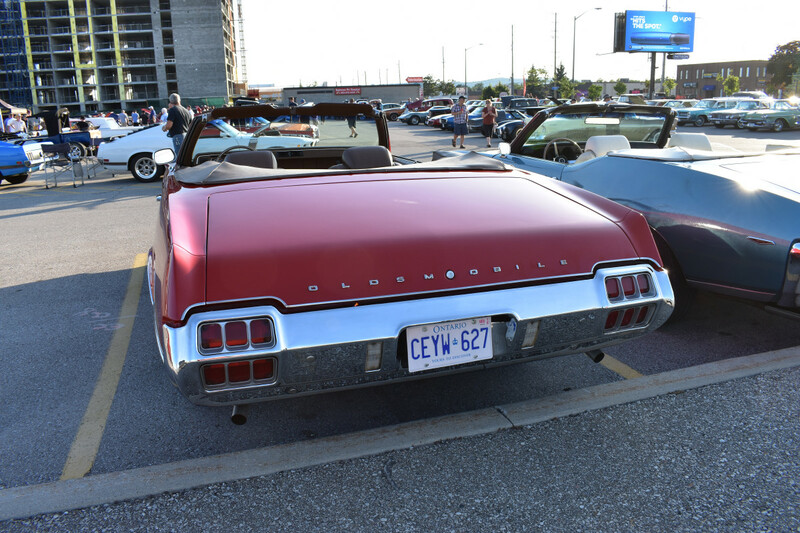 This is a recent registration (Ontario is using the letter C as its first letter on our license plates and has for the past year plus), so it must have come out of a resto project within the past year or so, (or have been imported) in that time frame. 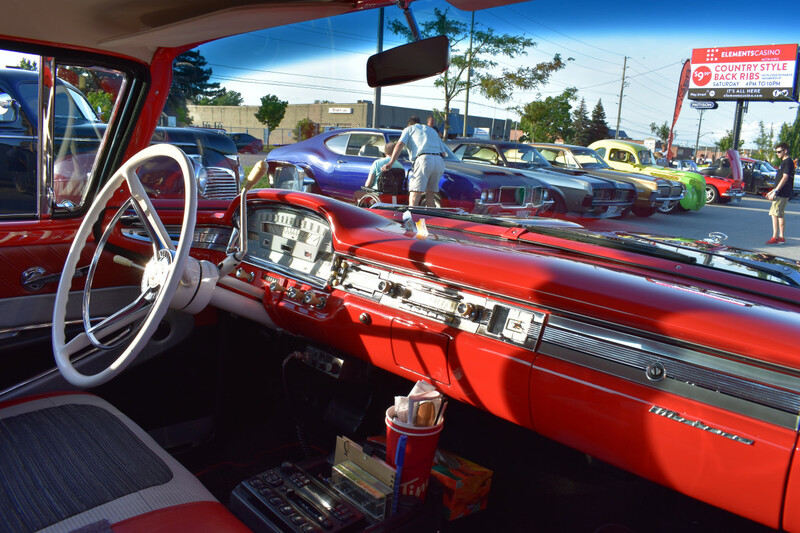 Two 1959 Chevvies were present at the show, batwings and all. These were both in fine condition. these cars are one of my favourite designs from the 1950s. A neighbour had one and would take 5 year old me for drives along with his granddaughter for ice creams. In terms of styling, these cars are polarizing, and divisive. Love ’em or hate ’em. There is nothing wrong with the front end, I would argue they had one of the best looking front end designs of the big three that year. 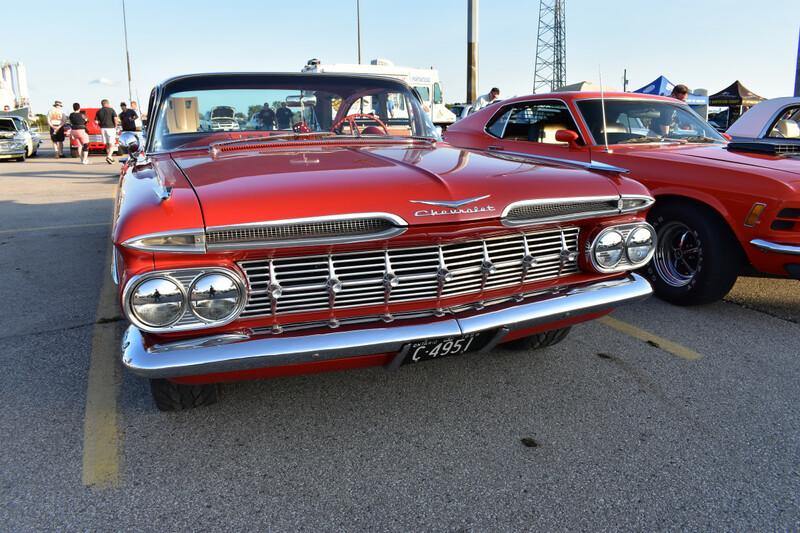 The Ford Galaxie had a strong resemblance to their delivery trucks that year, while the Plymouth had the fierce headlight look going on. 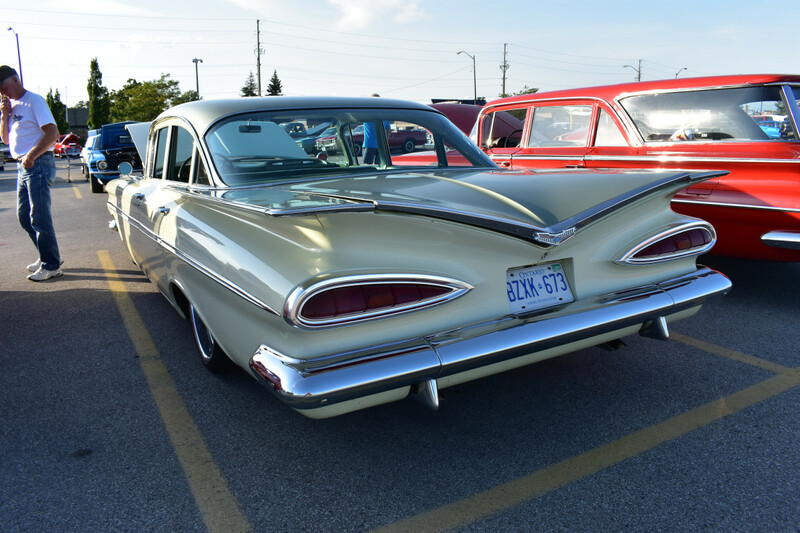 In addition, if one compares the 1958 and the 1960 Chev designs, the 1959 easily outpaces them in my view. Nice eyebrow intakes, and seven! count em – bezels across the centre of the grille. If anything, the 1960 seemed to me like a step backwards in front end styling. 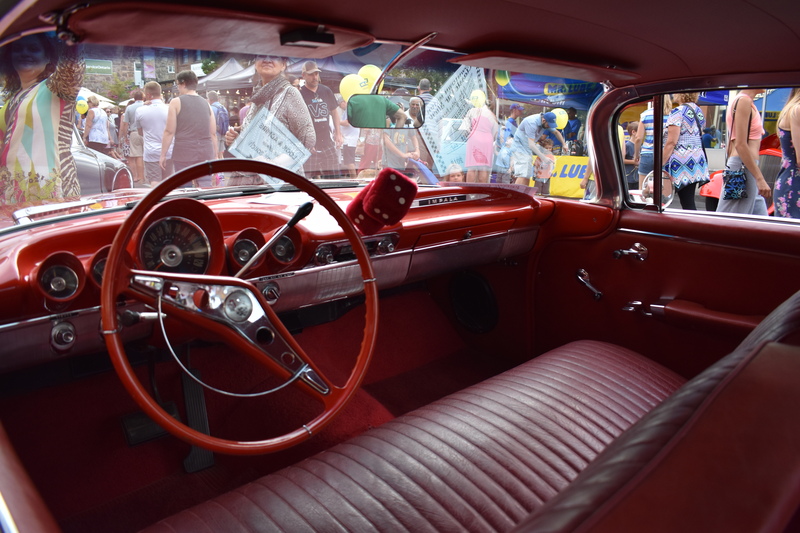 The rear decks is where people differ on the ’59’s design. I thought the batwing decklid was striking to the eye, looked very aerodynamic and smooth, and was certainly better looking than all those other cars with the big fins. I’m looking at you, Cadillac. I shot this photo out the back window from the driver’s side, to get an idea of what the driver would see when reversing. The back of the car was clearly visible, which would make reversing easy. I haven’t seen the rear most edge of any car I have driven for 20+ years, except maybe through a rearview camera. In writing this, I just noticed the other ’59 is photobombing the shot, alongside a 1960 for comparison. What a contrast between this dash and modern instrument panels. No touch screen, (not even any headrests), and I don’t even see an AM radio. 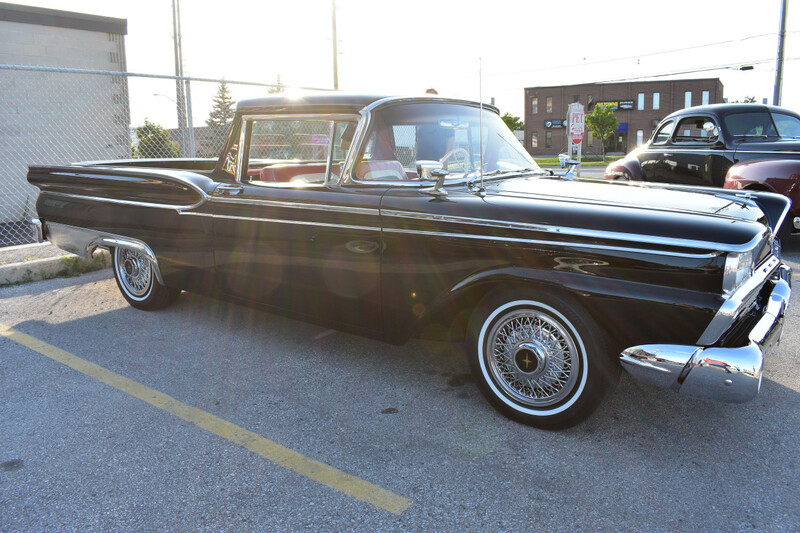 When I shot this, I thought it was a 1959 Ford Ranchero. When I noticed the chrome trim was missing on the B pillar that the Ford usually carried, I gave this machine a closer inspection. I saw the Meteor inscription, making this a Mercury Meteor Ranchero. This was a Canada only car. Having been introduced in 1957, it ran through to 1961, when the U.S. adopted the model and produced it until 1963. I am surprised that Mercury didn’t find a different name than Ranchero to apply to their version. something like Tierra (land) or Artemisa (sagebrush) or Vaquero (cowboy) possibly. I don’t feel that the wire wheels belong on this type of car. Obviously meant for working, these rims are out of place. The jet exhaust fins look out of place also. These were better suited on full size sedans, but not the Ranchero. A simpler treatment would have better suited a working type truck. I couldn’t find production numbers for the 1959 Meteor, but it must have been just enough to convince Ford to add it to the U.S. lineup. The car looks to have been restored faithfully to its origins. it looks to have an automatic transmission, and it is nicely appointed inside with a nice combination of red and white colours. A radio of some kind has been added below the dash. No, I haven’t been to Elements Casino to sample the ribs. Skipping ahead a decade or so, this 1970 Plymouth Sport Fury stood tall next to the recent model Camaro. I really don’t know what Chrysler thought was sporty about a huge Plymouth Fury. Perhaps the hidden headlights, or the trim level. I didn’t look closely at the engine, but it may have been a 440 in there. Believe it or not, base Fury models could come with a 225 slant six engine. Now I have all the respect in the world for the slant six engine, but I can’t see it efficiently moving a 3600 pound car like this. To my eye, the Fury looks more like a 4200 pound car, just visually. 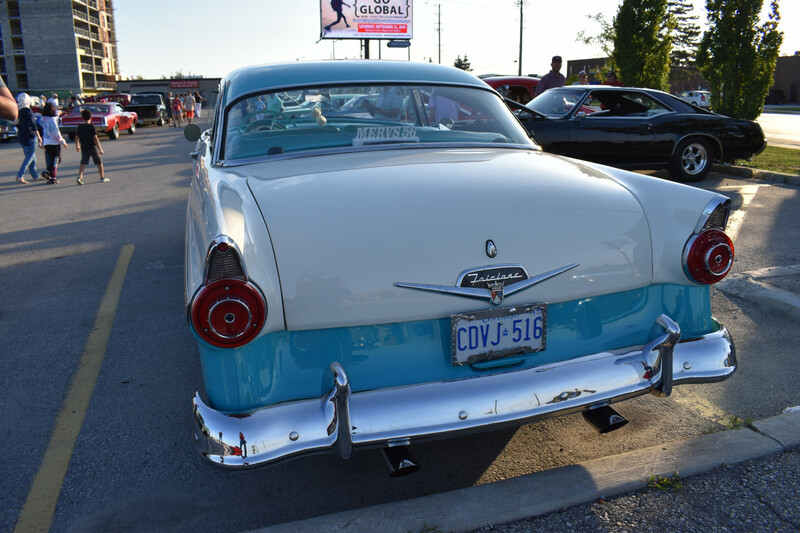 Look at the length of that trunk lid! I suppose the 225 would have seen lots of service in taxis of this type. 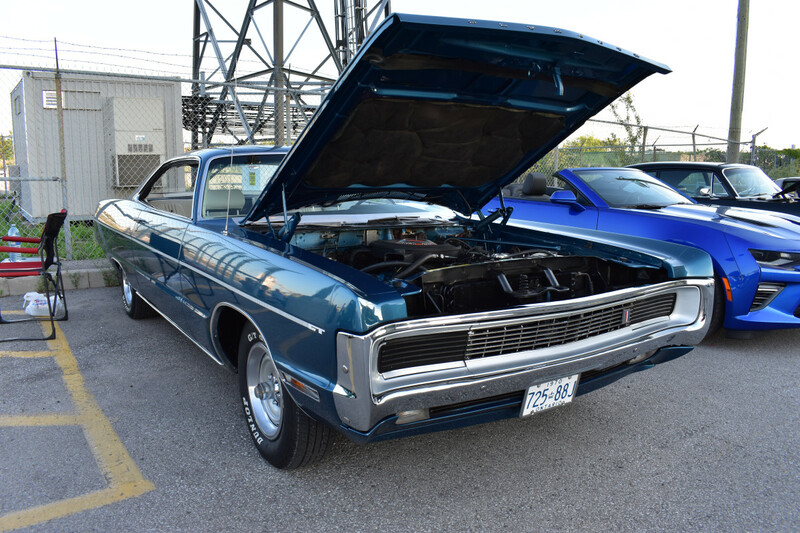 In any event , this Sport Fury in nicely finished, has likely been restored, and looks pretty clean. Raised white letter tires help with the sport vibe. On the whole, the car looks like it is trying not to be noticed. The slab sides come off as plain, and the hidden headlights seem to have that ‘don’t look at me’ air. The reputation of Furys and Monacos as taxis and police cars perhaps helps to contribute to that reputation. So there I was standing next to a GM A body from 1972. 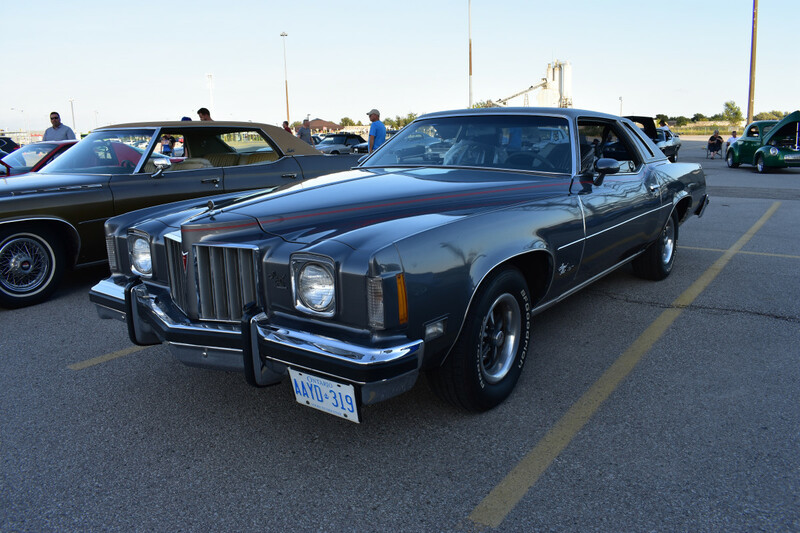 An Olds Cutlass. I glanced across its bow and noticed it was parked next to another convertible A body which I thought also to be an Olds. This should make a nice shot, a nice profile of their side views across the top of the doors. However a surprise awaited me at the rear of these cars. The blue one was a GTO! That made this comparison that much more interesting. The same upkick in the hips at the C pillar, the same slope coming off the decklid, and very comparable dimensions overall. It reinforced what I have read here on CC about how companies gave their divisions the overall envelope for their cars, and let them design within those overall outlines. Right down to the rear window winder handles, a lot of the parts came from the same corporate bins. 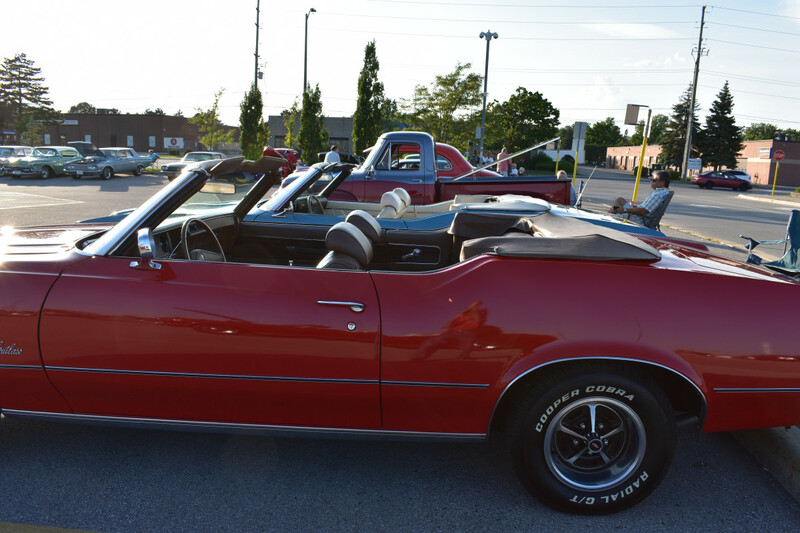 I spent more time admiring the Cutlass than the Pontiac, but both were in great shape, save a few paint chips on the GTO. I photographed a nice 1973 (I believe) Corvette. Also a good looking 1974 Buick. 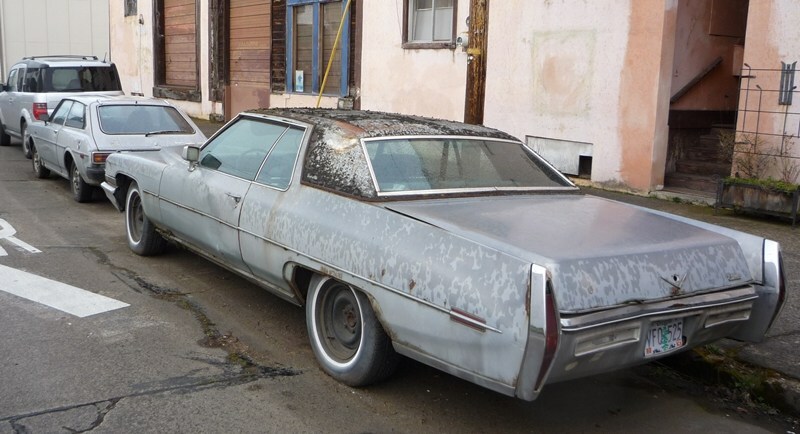 A friend had a 1975 or 76 Pontiac Grand Prix back in the day, and this one resembled it. I’m not sure why Pontiac decided to design the front end in such a way that the headlights had to protrude above the hood, requiring a raised layer (header) dovetailing into the hood. It detracts from the overall look of the front, whish otherwise was very striking. Even the pinstriping was a nice finishing touch. The dash reminded me of the layout on the 1975 Le Mans’ which I drove as part of a summer job at a brewery, right down to the “Radial Tuned Suspension” plate. 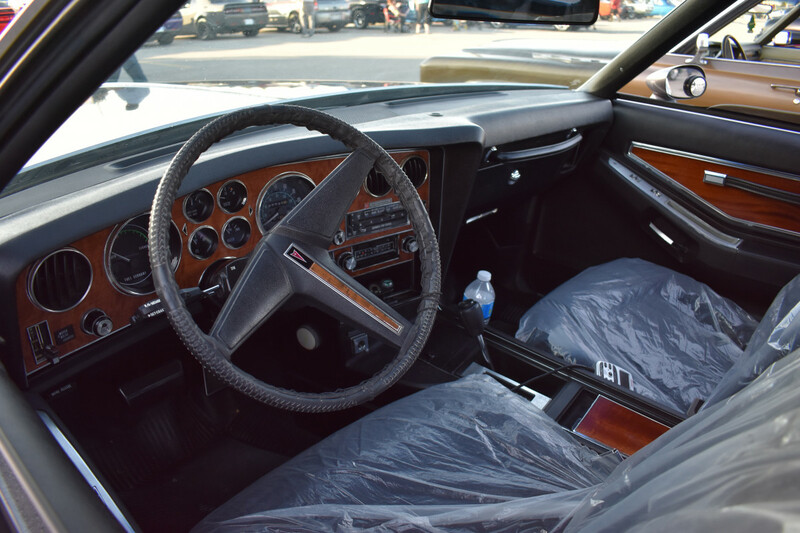 On this Grand Prix, the Cruise Control looks to maybe be an aftermarket replacement, but someone out there will know better. Finally, this is hopefully, the ‘before’ shot of a Vette headed for a wintertime restoration. It’s in a bit of a Frankenstein condition at the moment, so hopefully it will reappear in refinished condition again soon. Thanks for touring this show with me, I hope we can do this again together. Pop had a ’64 T-bird as his “station car” in the early 70’s. Just one in a series of “almost used up” cars he’d buy for a few hundred dollars and drive the 2 miles to the commuter train station. When they died, he’d buy another. One November morning, the car seemed chillier than normal inside. He looked over and realized the passenger door had been stolen. I guess they were getting thin in the junkyards by 1973. I’m constantly amazed at the trouble Detroit took with its Canadian hybrids, when the audience was just a few hundred for some models. This Meteorero has chrome trim that wasn’t on any of the US Rancheros. The top piece would have been shared, but the other two pieces look unique. Bean-counters clearly weren’t involved in these decisions. Update: I believe the Grand Prix I shot was a 1974. Lovely cars, especially the T-bird. That reminds me of last month at CCC at the meetup, they had about half a dozen of this vintage T-bird – Vanilladude and I thought the first rear bumper/taillight surround we saw looked “off” – comparing all of the others it appears when/if slightly bumped the whole thing bends making it next to impossible to have an even gap all the way around it between it and the body. Some of them had been bumped pretty much perfectly symmetrically so that at the center of the car it was about 1/4” away from the body but bowed out at the corners leaving an over 1” gap. and others were just off to varying degrees from the driver side to the passenger side. Once seen it couldn’t be unseen. And this particular car seems to add an issue with a dexk lid hinge which fouls up body/bumper spacing in yet another way. 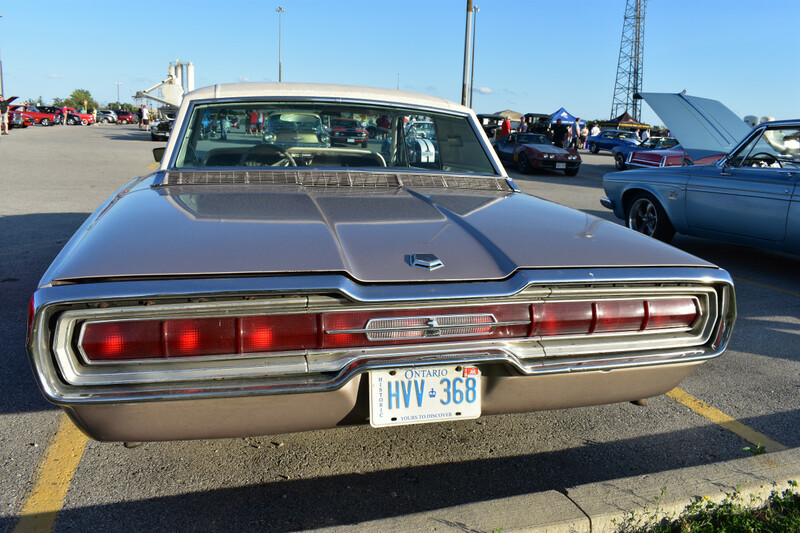 The Buick Electra looks more like a 1972 model than a 1974 model because of the smaller bumpers and a smoother front end, really like the T-Bird (the 1964-66 T-Bird’s were my favorites) and the Plymouth Sport Fury. 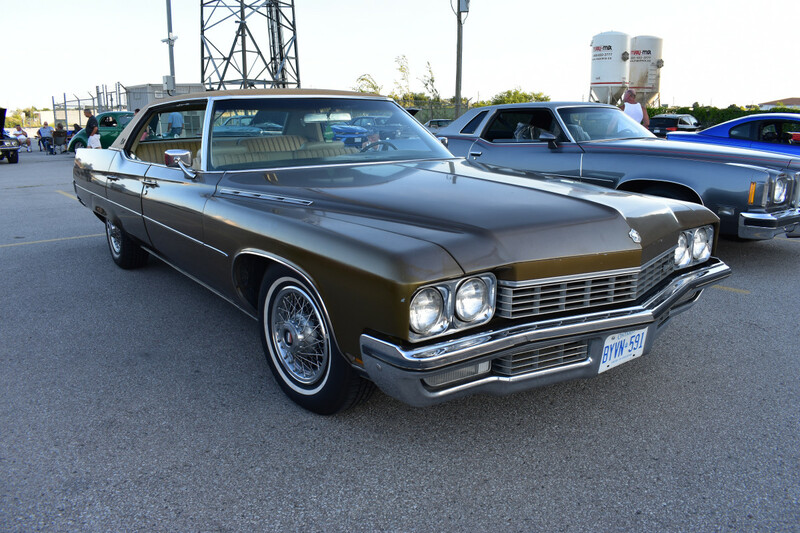 Agreed… that Buick is a ‘72, unless they did weird things in Canada. I know some of the cars south of the border (Mexico & South America) didn’t exactly line up with the model years here. Perhaps Canada didn’t have the mandatory bumper laws we all got here, alowing them to keep that ‘72 front end for a while. Canada did have the parallel law regarding the mandatory bumper. I agree this must be a ’72. I believe the GP’s raised headlight pods were meant to evoke the separate headlights of prewar cars- part of the whole “neoclassical” movement of the times. A fine selection Lee. 1959 Chev is one of my favourites as well. An interesting side note on Ont. license plates. I have noticed some C series plates have a smaller font, a bit shorter letter and more cleanly spaced. I haven’t been able to detect a pattern, but I like the new style. The old font still also continues in use as well. My current B series plates must have been made on a Wednesday, they are both still in good shape. My son’s car has a pre-letter A sequence (999-YYY) that experienced peeling. That registration was from 1996, initially on my Cavalier, so this problem has been going on for some time. I repainted the letters on the plastic coating (which I later learned you are not supposed to do), and it is still holding up. Apparently Ontario had a brief plate shortage hence the different die set. Great shots – I’ll have to hop the GO train from Toronto for the next one. 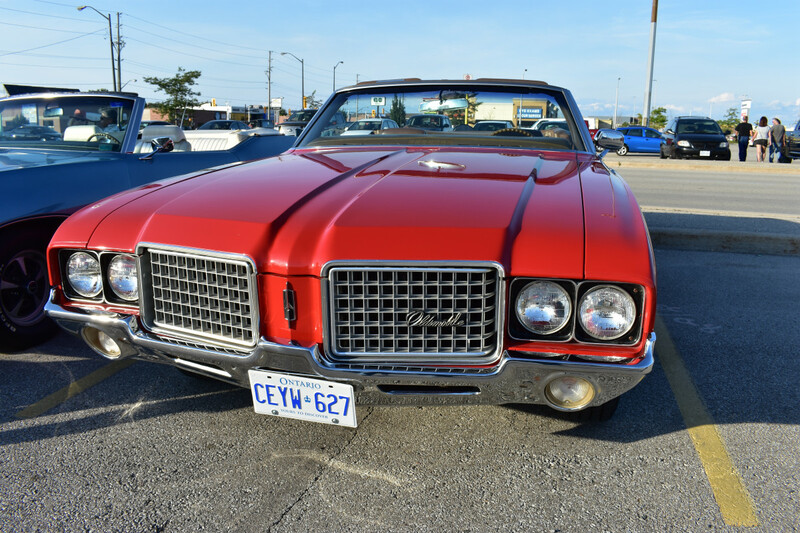 My favourites are the Cutlass and GTO convertibles, along with the Sport Fury. Somehow, I think it has something with a little more kick than a /6 under the hood. Just sayin’. By the way, I believe the tall dash in those old T-birds was referred to as a “Flight Deck” in the ads. Makes sense. After all, it was a Thunderbird. Weird variant of the CC Effect: this is the second time in as many days that I’ve seen mention of Milton. It’s weird because there’s not much of anything in Milton, as I recall from having bought name-brand tires inexpensively at a place called Cheap Thrills there, ten or fifteen years ago when I lived in TO. It’s the quintessential bedroom community, although its population has ~ tripled since you were there last. I went to Cheap Thrills a few times. It was an old warehouse with stock kept in shipping containers, mostly tires and lots of obscure rims. 30 years ago I bought one brand new Cragar knockoff rim (made by Reliance) in a 5×5 pattern for my van. I needed 3 more which would be improbable in today’s internet days. Back then it seemed impossible. Someone suggested Cheap Thrills. Sure enough they had a brand new set of 3 identical wheels in their vast maze of containers. They sold them to me cheap, maybe $25 each. It’s a great place, not sure if it’s still there. A quick Google search makes it appear they’re still a going concern, though they appear to have moved to a proper shop, now. That looks like a fine car show. I agree on the ’66 T-bird, it was the best looking of all and quite the costly freshening for a one-year only model. It’s interesting you note the waves in the Ford glass. Ford made their own glass (Carlite) for decades and it was frequently wavy. I’ve seen a few wavy windshields from the 60’s, although my own 60’s Fords were better. However about half my dozen-plus Fords have wavy rear windows, even as recently as MY 1993. I think they had a problem with compound curves because their side windows were always perfect. That is not a Mercury Meteor Ranchero. It is a Meteor Ranchero. Meteor was a companion brand to Mercury but it was a separate brand and would have no Mercury badges nor would it appear on the title and registration. Looking at Merv’s console it may very well be able to be removed in a matter of minutes and the plugs for the wires tucked up under the dash so that it would look stock if desired. Now that you mention it, I remember the radio ads in the ’60s about Meteor. “Where’s You New Meteor, Where’s Your New Car?” was the jingle. So Meteor was a separate brand after all, thanks for the clarification. As a non-FoMoCo follower back then, I had dismissed the nuance, figuring they were just trying to sell that model, much like Chevy had print ads selling the Caprice. It is interesting that it got a Meteor Badge and was called the Ranchero. Meteor existed to placate Mercury dealers and they other thing they did to placate them was to give them Mercury badged trucks. Meteors were Ford bodies with some unique exterior pieces and Mercury Trucks were the same Ford trucks with different badges. I guess this answer’s in a round about way that Ford considered the Ranchero to be a car first and foremost because if it was a truck it should have worn a Mercury badge. In addition to the pickups there were Mercury Econolines. Which brings up the question was there a Station Bus and since in the US it was the Falcon Station Bus, should they have been called a Meteor Falcon Station Bus? Some nice stuff. I think the Sport Fury would be my adoptee of choice. The grille on that meteor looks a lot like the texture used on American Mercuries that year. There was a nice Barracuda there that I shot, but not include in the article. I might have liked to take her for a spin. Sorry for the shadowing in the photo, it was late in the day. Looks like the Pontiac GP has a big vacuum gauge where you’d expect a tach today. I’ve seen a lot of these old GPs, but I don’t remember ever noticing that before. 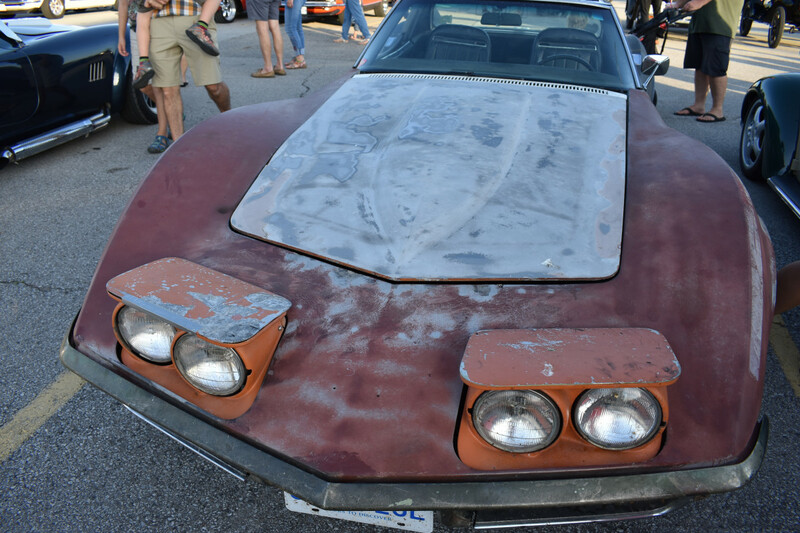 The GTO photo makes it look like the flank is full of bondo. Could be the image. The brown Buick really resembles a Cadillac from the windshield back. In that era, GM was still doing a pretty good job disguising the extent of their platform sharing. Sometimes a certain camera angle really shows the family ties. Good job with that shot. Thanks Rob. GM was certainly in love with the coke bottle upkick at the C pillar. 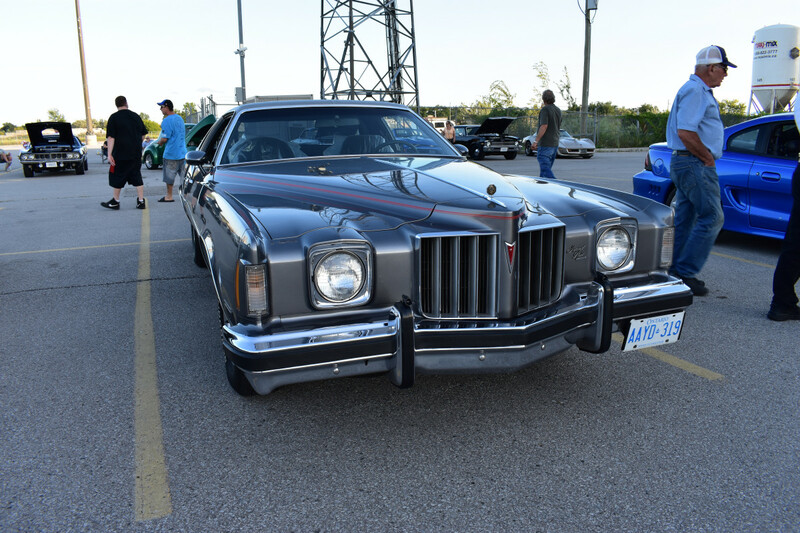 I see a strong Olds 88 resemblance along with the Caddy as you mentioned. Paul’s writeup of the 72 Cad illustrates the similarity. 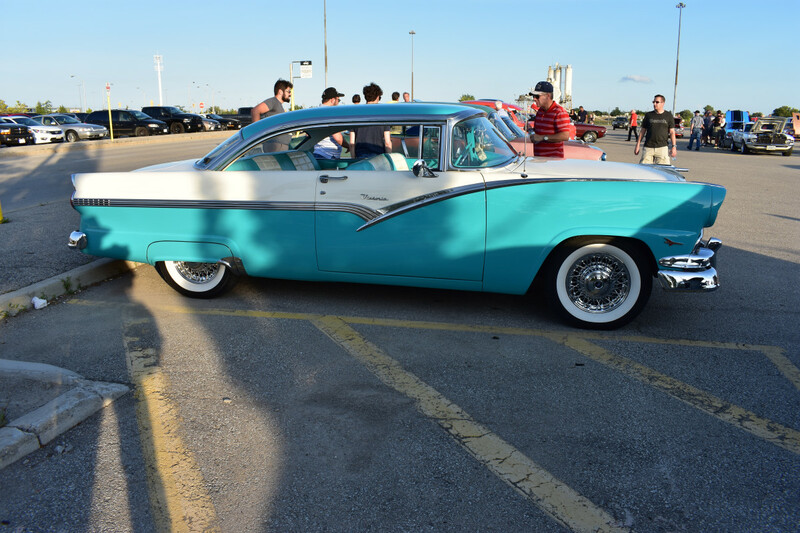 Nice to see such a turnout – evocative of what would often show up for a small-town cruise night, but much more extensive. 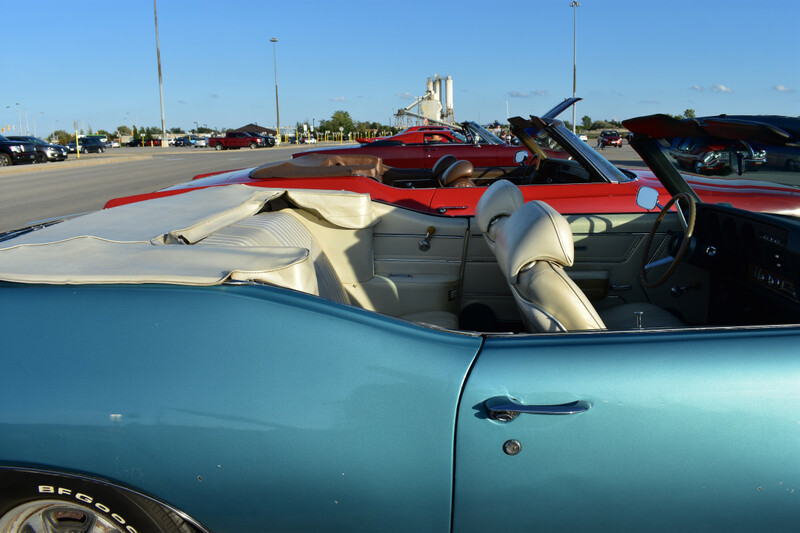 Also similar to a cruise night is the near-absence of anything not built in North America (there seems to be a Sunbeam Alpine in the background of one shot). 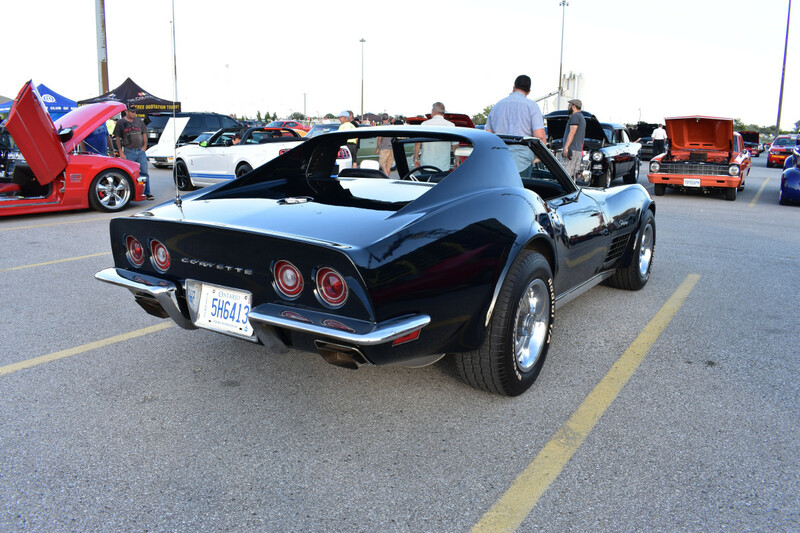 The paintless Corvette belongs to Clayton Seams, the writer at Driving.ca (https://driving.ca/author/mrclaytonseams) and part of the Reidus and Cletus online show (https://www.youtube.com/channel/UCubitu4BPy6XXLikNUJZO7A). It’s a 1970 with the 350hp 350, and I don’t think he’s painting the car anytime soon. Thanks for the update on the Corvette. I believe Clayton has sold his Chrysler as well. Here is the link to the origin of the “Readus and Cletus” Vette belonging to Clayton Seams. Also found in one of Clayton’s videos is the 1972 Buick I found at the same show. Cool! Thanks Inliner! 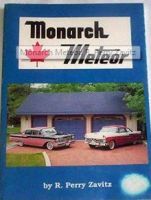 Not really – Meteor was a parallel brand for Mercury dealers to offer lower-priced automobiles, in areas where a Mercury dealer would be the only FoMoCo dealer within hundreds of kilometres. And not at all – the 1949-1961 Meteor was a full-sized automobile line, with a Ford body, unique trim, and sold in Mercury delearships. 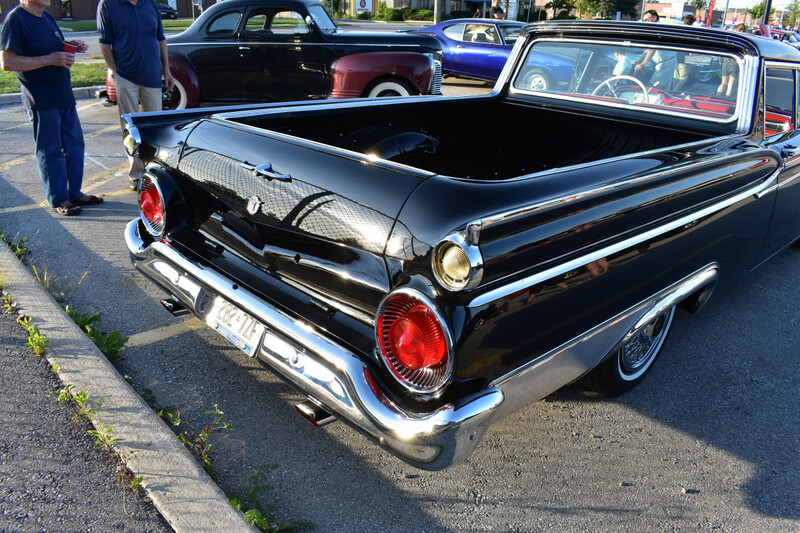 The 1962-1963 Mercury Meteor was a mid-sized vehicle, equivalent to the Fairlane of the same years. The U.S. didn’t adopt any Meteor from Canada. The Meteor as a separate marque was dropped in favour of the 1962-1963 Mercury Meteor, and brought back when the Mercury Meteor was dropped. We had a ’59 Chevy Brookwood. 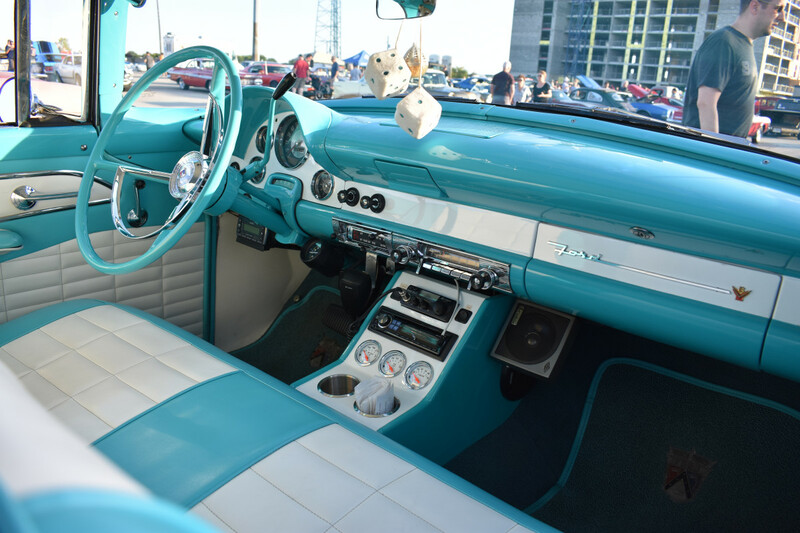 I heartily agree that the ’59, while radical, had all the details come together in harmony, even the dash. ’58 was a mess and the 1960 tone-down of the ’59 doesn’t do anything for me either. 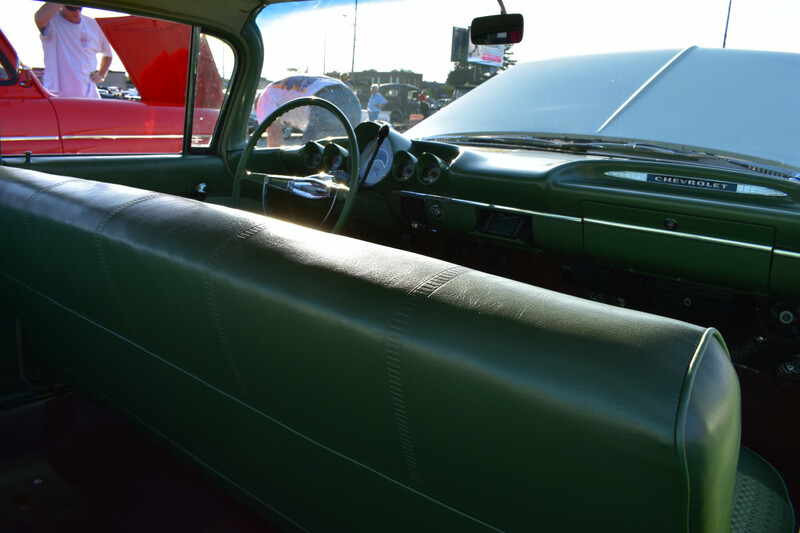 The dash of the 1959 is beautiful, although it neither evokes the batwing rear or the eyebrow front. It is artistic all the same, of its own merit. See photo from another show. To me, even the ’58 Chev looks more modern than the ’60. Meteor only produced a Ranchero for 1957 and 1958 and between the two years there were less than 400 made in total. There were no 59’s ever produced and the glove box emblem is from the 1949-51 era. 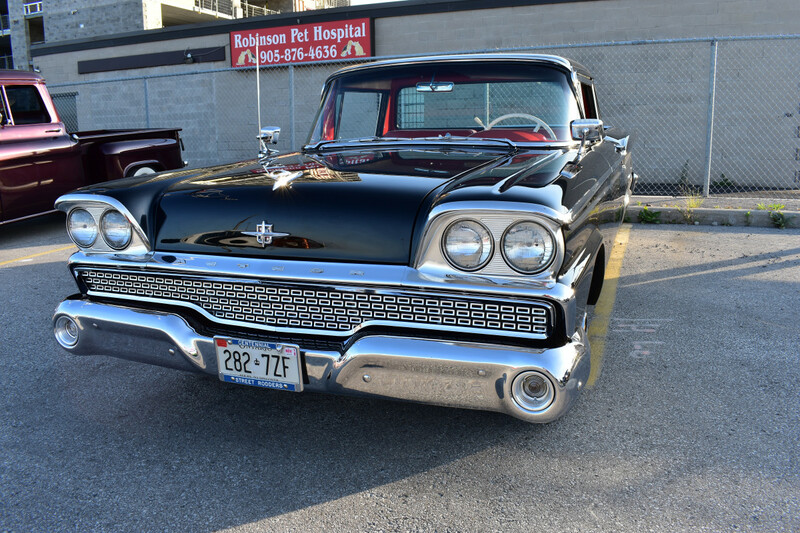 This black 59 would have been built as a Ford and had the grill and emblems swapped out to clone a 1959 Meteor passenger car (Rideau, Rideau-500, Montcalm). Meteor did produce a full line of Station wagons (minus a Country Squire) though. Authored by R. Perry Zavitz, Bothwell (ON): Quad Printing, 1993, 1993. Paper bound.